Hyundai Heavy Industries has already secured new orders for 11 ships, roughly 19 percent of its target for new ship orders this year, while none of its rival shipbuilders come near the largest shipbuilder in the world in new orders, industry sources said recently. According to sources, the shipbuilder and its affiliate Samho Heavy Industries, clinched orders for four drill ships and seven other super-large ships worth $3.8 billion as of Feb. 10, setting a record pace in getting new orders. The shipbuilder got another order for 10 container vessels for $1 billion, including an option for four container carriers from MSC Co., all 8,800 TEU class, with delivery set to begin in 2012. The shipyard aims to get $19.8 billion worth of new ship orders this year, up 86.8 percent from last year, and so far has already secured 19.2 percent of the target. If options are counted, which would be worth $1.8 billion for three additional drilling ships, the orders would jump to $5.4 billion, or 27.3 percent of the target. What is particular of note for the shipyard’s new orders for this year is that they include drilling ships, the area in which the company had been lagging behind others. The company made its first delivery of a drilling ship in November last year. Early this year, the company got its first order for a drilling vessel from Diamond Co. for 590 billion won followed by an order for two drilling ships from Noble Drilling Co. worth 1.14 trillion won. On Feb. 8, the company signed a contract to build the largest transport vessel carrying a marine installation worth 265 billion won and also received an order to build a marine plant for deep sea gas drilling in Qatar for 1 trillion won on Jan. 12. In the meantime, among its rivals, Samsung Heavy whose total overseas came to $9.7 billion last year, has yet to get a new order so far this year. Daewoo Shipbuilding and Marine Engineering has only received a single order for a deep sea drilling ship from a U.S. company so far this year. STX Offshore and Shipbuilding secured orders for four bulk carriers worth $160 million and six other vessels valued at $290 million. Hyundai Heavy’s enviable performance has been linked to high oil prices that spurred oil exploration and the excellent new drill ship that the company developed and put on the market. Industry sources said the shipbuilder avoided getting orders for drill ships last year due to low prices, but the company has begun to receive orders since late last year, displaying its dominance. Hyundai Heavy Industries, founded by the late Chung Ju-yung on March 23, 1972, wrote the first chapter of its shipbuilding history in June 1974, by completing construction of the world’s largest shipyard and two 250,000-deadweight ton (dwt) VCCCs all at the same time. A decade after its first delivery, the Hyundai Shipyard topped 10 million dwt in aggregate ship production, and has maintained the leading position in the world shipbuilding market ever since. Hyundai Shipyard’s drive has mirrored the growth of modern Korean heavy industry, and the company’s success has allowed it to expand into other heavy industrial areas, ultimately leading to the formation of Hyundai Heavy Industries, an integrated heavy industry company. The latest chapter of the company’s history began with its separation from the Hyundai Group in February 2002. 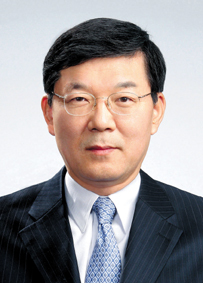 The independent establishment of the Hyundai Heavy Industries Group included mergers with Hyundai Samho Heavy Industries and the Hyundai Mipo Dockyard.